We have seen shirts and trousers having pockets but I bet you haven’t seen a mug with a pocket. 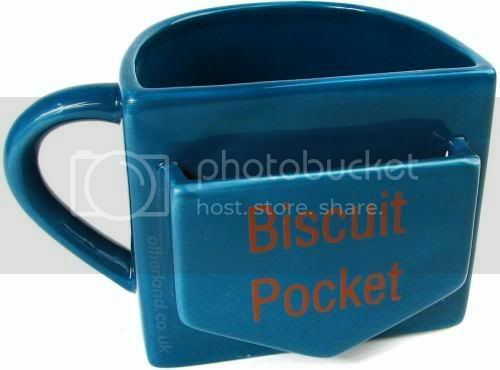 Here’s a mug known as “The Perfect Cuppa Mug” which has a pocket which holds your biscuits and cookies. The mug is 4 inch wide, that’s pretty big isn’t it? This mug is basically a half of the real mugs that we use. The other half is transformed into a pocket. The pocket ain’t really big enough to hold more than one biscuit. The mug is made up of stoneware ceramic and is microwave safe. It comes in an attractive box, perfect to gift someone. The mug is Blue in color and the writing’s red. If you liked this mug you can get one from here for $13.